The whole world is on Facebook, so where better to sell your books than on your own Facebook store? There are so many ways to promote and sell your books, but without a doubt, Facebook should be a sales channel for you to connect with readers and book buyers. Let’s look at how to sell on Facebook. While some might immediately think of Facebook advertising as a means of enticing book buyers, this is not necessarily the best route to take. Firstly, because it can be very expensive, and secondly because direct ads are not always very effective. A much better, long-lasting and more cost-effective strategy to take on Facebook is to steadily build Likes for your Facebook Page and to set up your Facebook Shop tab to sell your books directly to your followers. By taking these two actions, you can steadily build a following for your page and have your books available with a single buy click for your Facebook book readers. You should be continually working on building up your page Likes, as this is the only way you can connect your page with other Facebook users. To get organic Likes, you need to be adding great content to your page that people will want to read and hopefully, share. Very often, these will be your blog posts, but you can, of course, write individual, or unique posts on your page. Sharing high-quality articles is also another way to attract Likes. Yes, I know it can be slow going to attract Likes organically, but they do happen over time and become easier to attract as your Like count increases. The quicker way, of course, is to pay Facebook to get the Likes for you. If you have a relatively new page or a very low Likes count, this is often the most effective means. It is also much more cost-effective than pay-per-click Facebook Ads for your books. On average, when I have used Likes campaigns on Facebook, the average cost per Like is between $0.08 – $0.12. This is extremely good value when compared to paying more than $1.00 per click for an ad to a book buy page on Amazon. Also, a Like is a long-term user gain for your Page, while a click from an expensive Facebook ad lasts only seconds and may not even end in a sale, or a page Like. Selling online with a dedicated ecommerce platform is not a choice for authors. Ecommerce websites are very expensive to set up. But there is an easy way to have something similar, and on the biggest social media platform – Facebook. 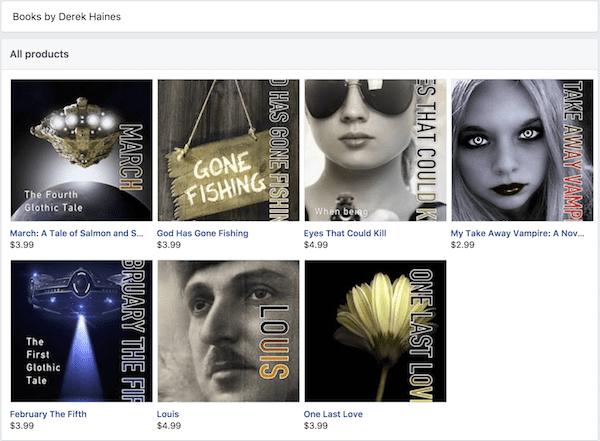 It is very easy to add a Shop tab to your Facebook page where you can add your books and have direct buy links to Amazon or any other book retailer you use. Yes, you can sell your books on Facebook! 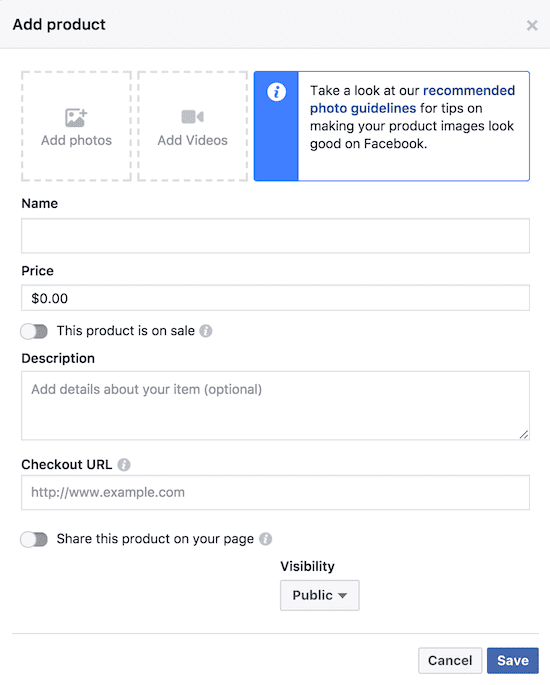 There are a few options when setting up your online store on your Facebook business page. Here is what you need to do set up a shop to link directly to your books on a retailer site such as Amazon. It will import your buy links and products to Facebook. 1. On your Page, click the Shop tab. If you don’t see the Shop tab, follow these steps to add it. 2. If you agree to our Merchant Terms and Policies, check the I agree to the Merchant Terms and Policies box, then click Continue. You may be prompted to re-enter your Facebook password for security purposes. 3. Choose Check Out on Another Website and click Continue. You will include the website when you add products to your shop section. 4. Choose the currency you want to use. This currency will apply to all your products and can’t be changed unless you delete your shop section and create a new one. Once you have your shop tab set, click it and you can start adding your books with this form. Complete the information for each of your books, and add the link to your book on Amazon in the Checkout URL. You can use any retailer link, such as Google Play, Apple or B&N, of course. But you can only add one Checkout link for each book entry. It can take a few minutes to process your books, so don’t panic if a book you enter takes a little while to go live. When I set up my shop below, five books processed within a minute, but two books took over 15 minutes to process. Just be patient. Once you have entered your books, your Facebook bookshop is ready and visible to your Page followers. With one click, potential customers will be on your book buy page on Amazon. From your admin page, you can share your books on your timeline in a Facebook post anytime you wish to help you with book promotion. Another great feature of the Facebook Shop is that you can tell your followers when you discount your books. This is particularly useful when you might have a free ebook campaign on Amazon KDP Select. If you use Amazon Associates, you can use your link, which will earn you a little more, and is useful for click tracking. With so many people using Facebook as their primary means of using the Internet, it is a no-brainer that you should be selling your products (books) directly from Facebook. Many Facebook users spend hours each day there, so giving them a shopping experience and the option to buy your books directly is a high priority way to promote your books. However, your Facebook shop will only be of real benefit if you have a healthy number of Facebook Likes and follows for your page. So keep working on attracting Likes. A small investment of only $5.00 per day for a few days in Facebook promotion can really get things moving. From my own experience, $5.00 usually attracts between 30-45 new Likes. However, book promotion is never about only one avenue. So while a Facebook shop should be a high priority, keep working on other ways to promote your book and spread the word about your books as wide as you can. Further reading: How Will Your Book Cover Look On Facebook? Thanks for the advice. I didn’t know you could pay to get facebook likes. I’m not seeing the “Check out URL” field for my new Product. Did Facebook stop allowing this option? Also, I didn’t see the “Check Out on Another Website” option for my Shop.